← The Album Is In! 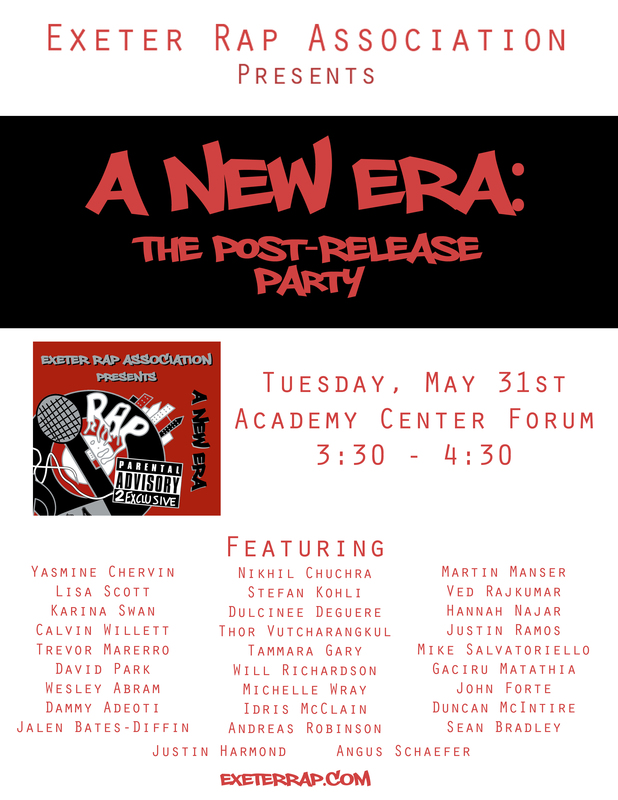 Join us on Tuesday to celebrate the release of A New ERA, the official album of the Exeter Rap Association. The creators of the album, Justin Harmond and Angus Schaefer will be discussing what went into the project, showing behind the scenes footage, and playing tracks off the album for your listening pleasure. This will also be one of the few chances to buy a physical copy of the album. The album costs $10 per copy. If you have already preordered, you can pick up the CD at the end of the event. If you preordered with cash and haven’t paid yet, you must pay before receiving your copy. To see the tracklist and preview some of the songs on the album, click here. This entry was posted in Cool Stuff and tagged A New ERA, ERA Album. Bookmark the permalink.